My brother-in-law, Seth, and I actually won a grass volleyball tournament! We dazzled the competition with our sunburns and laughter, and took home the stellar grand prize of...T-shirts. And don't forget our team pride, of course. Go Team Cranberries! We need $$$, not t-shirts! If I ever could figure out how to actually invent things and not just think of them, maybe we really could be rich. But until then, I'll just relax in the lawn chair on the driveway supervising our never-ending yard sales and thinking of things like leave-in conditioner/hairspray with SPF and contact lenses that protect the eyes as well as sunglasses. They've had prescription glasses that tint in the sun for years now; why can't they transfer that technology into contact lenses? I'd do it if I knew anything about science. Our Groupon dentist cleaning deal has turned into this circus of teeth whitening and smile therapy. We got examined and interviewed to prove that we would be good candidates for whitening. One of the questions was, "So, why have you decided to whiten your teeth?" I answered, "I haven't, my husband has." (And really we just want you to clean our teeth, so can we cut the cosmetic crap already?) Groupon is great, and definitely provides interesting experiences. This issue goes back to the Monet-pond-drop in April, when I had to resort to my blue pair of "funglasses." But those broke two weeks ago, and athletic tape has not proven efficient in this case. I refuse to spend more than $10 on sunglasses because I lose or break them too easily, and I'd prefer to spend $5 or less. We finally found the very last $2.50 pair in the Target dollar shelves, then my sister-in-law, Alex, gave me an extra pair in the very next hour. Two pairs for $2.50? I'll take it! 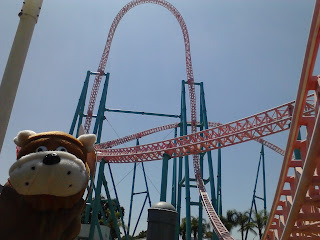 Alex helped me out in three ways: 1) buying us military discount tickets to Knott's Berry Farm; 2) dropping me off in Irvine on her way to get a friend at LAX; and 3) she also ended up being my pick-up much later that night at the train station after a long day at Knott's. I got to breakfast with my coaching pal Jeff, then theme park it with my tall friend Ian. Jeff determined since I no longer have a car at my disposal and I have sworn off cell phones, I am essentially equivalent to the same state of independence that I had as a junior higher (back in the good ol' days of 1999 when junior highers did not have cell phones). I knew I was in for a full day when Ian said, "I'm scared of heights, so we're going to go on all the high rides." Awesome, there goes my excuse then. 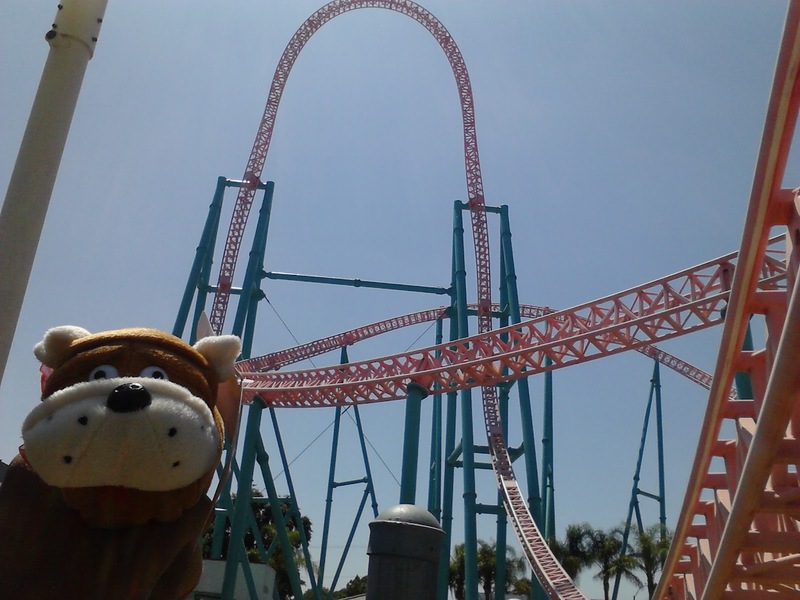 Knott's was way better than I remembered it from 15 years ago, and that is due to the fact that I got over my extreme roller coaster phobia during high school. But maybe I just got over the phobia of getting in the line and actually buckling into the ride - because I still screamed like a maniac on the Xcelerator and Supreme Scream rides. At least I laugh more than I scream, for the most part. Ian and I tried eating funnel cake and fried rice (not together) and made a large mess of powdered sugar and flying rice (again, not together). The Log Ride provided a nice clean-up. Happy 4th of July! American holidays are still great, but they are definitely different now that Marc and I are choosing to live out of the country. But it all worked out because on Independence Day, my aunt graciously put together an entire grill bash, and we all got to hang out the whole afternoon! 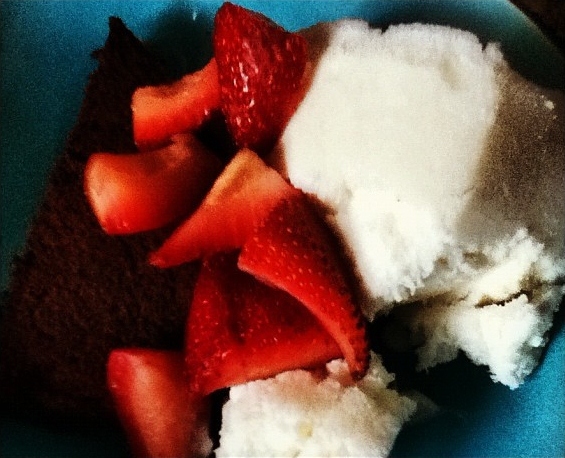 I coined Lois' ice cream bar as Firework Ice Cream, and the dude on Storage Wars said something was "Francy." However, the most interesting idea of the day was the peanut butter. In the area for hamburger condiments. True story. Marc and I aren't that daring yet, but my cousin's fiance, Any, jumped for it and liked it. Of course, this is the girl who grills her cheese with peanut butter and bananas. Bias! The sister came over for the evening, and I overcooked the French dessert while we practiced her French. She's actually pretty good for no training, which goes to show that if you want to learn, you will. During the day, Marc and I had to adjust names/owners on our bank accounts, and we made $50 at NavyFed just for signing me up for an account! I am a member of this special military bank now, so watch out. The French dessert just turned out to be like a brownie cake, and we woke up to find it had been attacked by somebody after we had gone to sleep. I say attacked because the person had chowed the whole middle (the best part) of the cake and left only the edges. We settled for some edge bites and moved on with our day. Later we were talking with Ingrid and laughed about whomever had eaten the cake. Then she told us who had done it. Thanks for throwing it away, people. Idea FAIL. While we were getting over our new level of intimacy with the dog, Marc was working on a t-shirt blanket project and hit his "need food now" moment of the morning. "I need real food," he said, "like meat, and a lot of protein and stuff." I walked back into the kitchen, and started pulling items out of the fridge. My brilliant idea was one of Marc's regular favorites: the breakfast burrito. So I threw the eggs into the pan, found the bacon, and grabbed some other random leftover burrito ingredients. Somewhere between my starting point and cooking, my mind was so focused on making sure there was enough filling food in the burrito that it accidentally became a mess of breakfast and normal burrito. I had the tortilla filled with eggs and bacon, then tossed a leftover mix of black beans and sweet corn into it. That was pretty okay until I went right into placing the rice and refried beans on top, and I started laughing because I finally realized what had happened. It was too late now, so I finished it off with the cheese and guacamole. Good thing men will eat almost anything when they are hungry! Bet that was a better meal for the dog than my chocolate brownie cake. Yes, back at it again, but this is the mellow version compared to my previous summers. I'll be "going hobo" again all over California and doing all the final American things before taking off for France in early August. Final money-making idea: can I get a job as a professional suitcase packer? I definitely won't be hired as a cook.